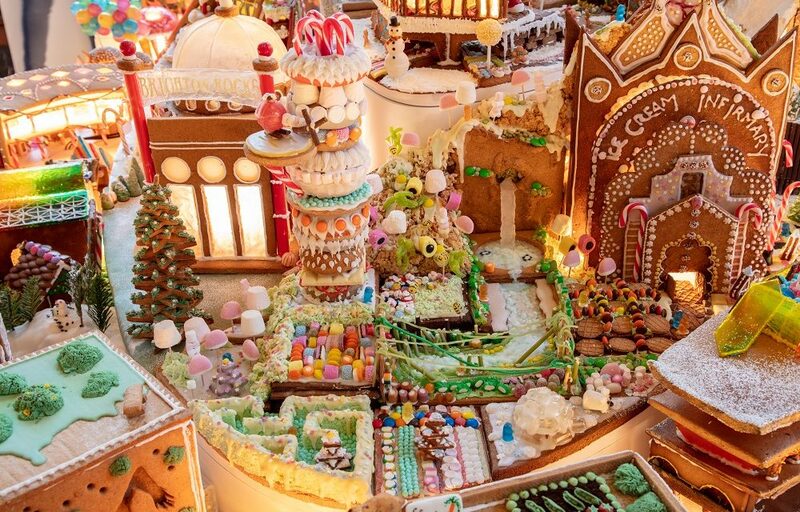 This December, the Museum of Architecture are exhibiting the most scrumptious Gingerbread City imaginable! Now in its third year, this is an annual celebration which aims to get people thinking more about the kind of places they want to live, work and play in. The theme this year: ‘Imagining the Future City’ where contemporary, experimental and innovative design was encouraged to create a healthy and social lifestyle for the Gingerbread residents. Perfect for us – we spend a lot of time thinking about Shaping Future Places! Our plot was the ‘Ice Cream Infirmary and Gingerbread Gardens’, the city’s hospital. The design features botanical gardens to improve the wellbeing of the patients including; an Isomalt sugar waterfall pouring from the Rice Crispy cliff, an igloo with resident polar bear, the marshmallow forest, giant bees, a coconut ice maze, Christmas trees, allotments, an overgrown tropical swamp, dolly mixture ambulances and a donut tower with its own helipad and ‘Chuppa-copter’. The building itself is constructed entirely of gingerbread – no hidden structural support here – and features waffle cone texture elevations joined together with Foxes glacier mints. The exhibition is on between 8th Dec and 6th Jan at the Victoria and Albert Museum. Check out our entry alongside over 60 others! Tickets are available here. The Gingerbread City Instagram competition is now live – each creation has a photo on the dedicated competition page, and the one with the most likes will win fan favourite. You can vote for ‘Ice Cream Infirmary and Gingerbread Gardens’ here.